Daybed Size Bed Dimensions are usually twin size bed dimensions of 39 inches by 75 inches. There is a full or double daybed size of 54 inches by 75 inches but these are a bit rare. These are Daybed size mattress measurements. Daybed Size Mattress depths can vary from just a few inches to 14" or more. Generally, you want to keep a daybed mattress lower profile or lower height so you don't hide the fancy backboard. Many times, actual daybed mattress dimensions will vary by one or two inches, usually smaller. When selecting just the right daybed covers or ensembles, there are several things to consider. Daybeds are as popular as ever and consumers have several options available to them in making sure that the style, fabric, and color of your daybed cover if right for them. The many styles and colors available make decorating with daybed covers easy and fun. We are seeing a revolution. The revolution is changing the way fabrics are made and the types of fibers that used to make them. The trend toward the use of natural and renewable plant fibers in fabric weaving is changing how we look at everyday household linens. The making of towels, upholstery and bed linens is being transformed. This trend is no less apparent than in the growing demand for daybed covers and ensembles made from natural plant fibers. 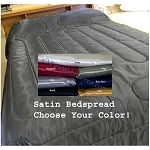 For many years, cotton has been the predominate choice in fabrics for bed linens. The introduction of polyester, nylon and other synthetic fibers has not diminished the popularity of cotton. There are certain aspects of how these fibers are developed that have created a greater demand for natural plant fibers. Despite being a favorite fabric for daybed covers and other household linens, cotton cultivation presents a few problems of its own. Cotton is a shrub type that has been used as a fabric source since the eighth century B.C. Harvested from the boll of the cotton plant, the fiber can vary in length up to two inches long. With its long fibers and soft feel, Egyptian cotton is considered the finest in the world.